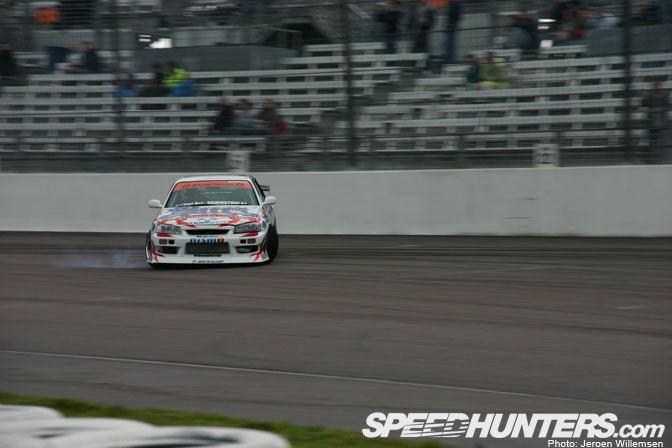 The first time I ever saw Japanese drifting in person, was at an event called GT Battle, held at Rockingham Circuit, UK in the summer of 2005. After watching a lot of JDM Options and reading any Japanese magazine I could get my hands on, I was pretty excited to see two D1GP icons on European soil. 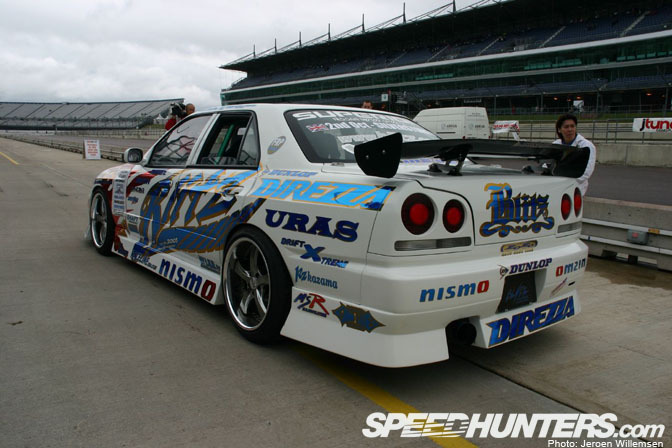 The event was held in preparation for the D1GP that would kick off later that year at Silverstone on the 2nd of October 2005. In the morning we headed out to the circuit and there I saw the Kei Office green S15 and Nomukens ER34 Skyline for the first time in my life. It’s a moment I’ll never forget. 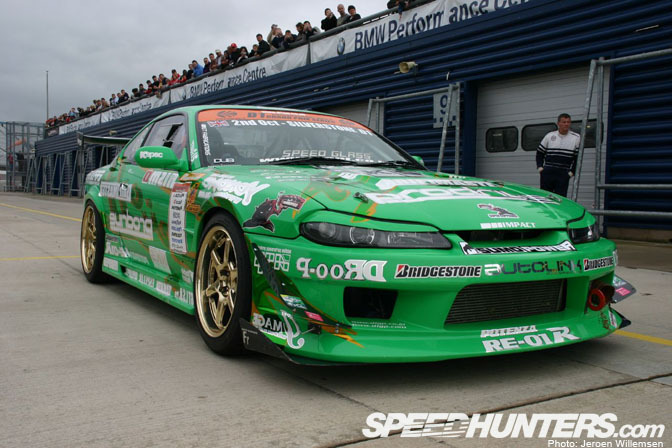 Here’s the famous 2005 D1GP championship winning car: the Kei Office S15. 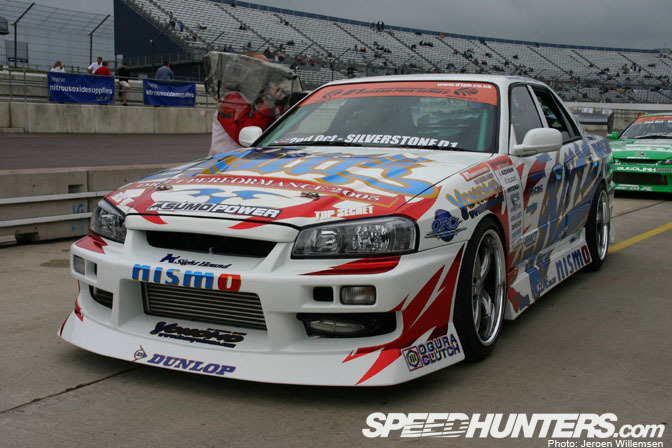 To me, this car represents the golden era of D1GP; it hasn’t been the same since drift machines like this disappeared from the series. 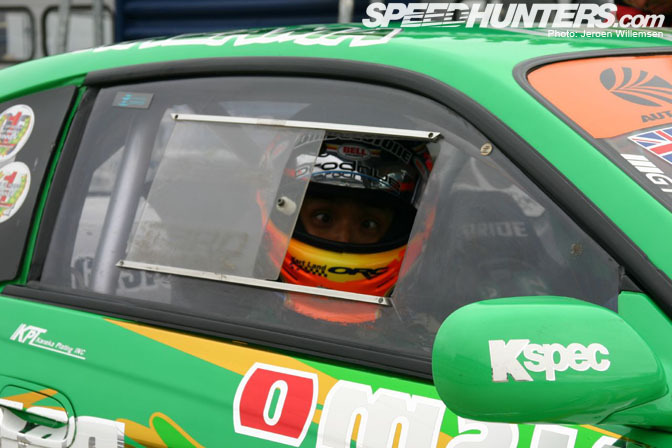 2005 was also the year that Ryiju Miki retired his Top Secret S15… luckily for me; I witnessed him during the Silverstone round later that year. I wonder if people who would like to see some pictures from that event? In my opinion this was the best livery ever for Nomuken’s ER34… When I compare it to the 2009 livery I think this one worked far better. The body-kit also looks much better too IMO. Thinking back to this event, it was very cool to be this close to the cars and hear them start up the engines. I still like the look of this large four door saloon. In the background you can see Abe, the mechanic that was responsible for the car. He now drives in the D1SL series. The gold Prodrive wheels worked very well with the green exterior…. I have never seen a similar combo since then… A chunky Sard rear wing made sure Kazama had enough downforce on his rear wheels. After I had met Nomuken and Kazama in person earlier in the day, Kazama recognized me and made all of these funny faces before he went onto the circuit. Both drivers were very laidback and they took all the time for you, despite the language barrier. 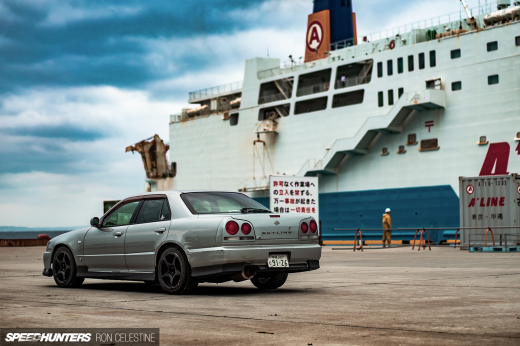 This is why we turned up at GT Battle: to see drifting in its purest form. After seeing Kazama and Nomuken perform their drift demos, I was hooked and have been ever since. was an awsome an event that! got to hang out with saru san himself at the rc drifting! I agree with you about Nomukens car! Didn't realise Sard had diversified away from it's fuel injection products to delve into the world of carbon aero products. Abe san and Nomuken have been together for A LONG time....great team work ! About the ER34, i do like the 2005 model more than any after it. But the 2003 was my favorite. wallpaper request for 2nd and 3rd pic please!! I think it's sad how these two cars ended up being some of the first marketing whores (Norton for Nomuken, AVEX-m.o.v.e. for Kazama.) That's when you knew everything was getting way commercialized. Hey Jeroen, I remember seeing on your blog that Kazama's S15 ended up somewhere in Finland. Any pics on that? In retrospect, i just look like another cookie cutter drooling fan i know, but again, i would love to see the rest of the coverage from this outing! Your story reminds me of when I saw D1 in New Jersey. I had flown to Cali to see D1 for the first time prior to this event, but Jersey was just special. It was one of the best experiences ever. In one day I got to see Nomuken, Imamura, Kumakubo, Tanaka, Ueno, and Toshiking. I also got to see Smoky and meet Jun Koyama(!!!!) for the first time. Daijiro was also there just walking around checking out the scene. It was the best event because all the D1 guys were just hanging out with us fans as if it were a normal drift day or something of that nature. We got up close and personal with their cars and with them. Truly a great experience I will never forget. Since then I've traveled all the way to Japan to see them in action! Luckily JR was there and he ripped up the course with that little AE86. Really made me open my eyes to American talent! Please do post up more pics! I miss seeing Kazama and the Kei Office S15. Speedhunter Regular Martin Ffrench debuted at this event and finished Second overall ! I remember this event well, I was driving in the amatuer drift demo outside the event but everyone [including drivers] cleared away from the demo and ran to the stands when Kazama and Nomuken started their demo. It was truly breathtaking to see at the time. But look how empty the stands were! Drifting was barely heard of in the UK back then! Grassroots practice days get that many spectators nowadays! 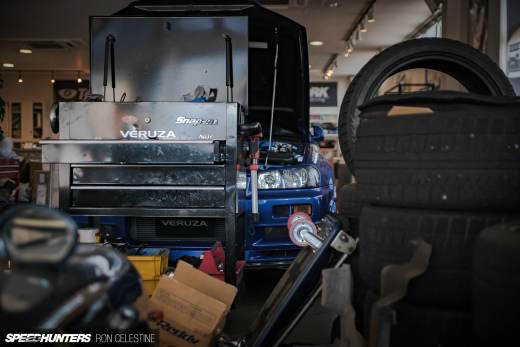 I remember reading about this way back when it was in that issue of Japanese Performance, I wanted to see Nomuken's R34 in the flesh so bad and I did on the 2nd of october at silverstone, I remember walking around the pits just staring at the Blitz R34 with my mouth wide open, I was only 12 at the time but it made a big impact on me. I was at this event and all I can say was that it was a good time. It was the first time meeting these guys in person. And meeting Tsuchiya and Daijiro Inada made my day complete. i was a member of the crowd above the pits in that top photo! !